Natural IgM has a wide range of actions in the immune system. Here we demonstrate that mice lacking serum IgM have an expansion in splenic marginal zone B cells with a proportionately smaller reduction in follicular B cells. The increase in the marginal zone-follicular B cell ratio (and an expansion in peritoneal B1a cells) is fully reversed by administration of polyclonal IgM, but not by two IgM monoclonals. Mice engineered to have a secreted oligoclonal IgM repertoire with an endogenous membrane IgM also exhibited a similar expansion of marginal zone B cells. We propose that natural IgM, by virtue of its polyreactivity, enhances Ag-driven signaling through the B cell receptor and promotes the formation of follicular B cells. These results demonstrate that natural IgM regulates the selection of B lymphocyte subsets. Natural serum IgM provides a first defense against infection and accelerates the development of the primary immune response (1, 2). Mice deficient in serum IgM (Sμ−)3 also have an elevated response to T-independent Ags, an expanded B1a cell subset, and an increased propensity to develop IgG autoantibodies (3, 4). Although B1 B cells have been characterized as a major contributor to natural IgM production, the mechanism underlying the elevation in B1 cells when serum IgM is absent is unclear. Splenic marginal zone (MZ) B cells, have been identified as having some similar properties to B1 cells including contributing to IgM secretion. Both MZ and B1 cells have been implicated in the rapid, early response to infection, including the T-independent response, in autoimmunity and lymphomagenesis (5, 6). Recent evidence has suggested that only a minority of newly formed B cells are selected for maturation through positive selection by Ag (7, 8, 9). Once the immature B cell has reached the spleen, it can develop into follicular (FO) or MZ B cells, and this decision may be governed by a number of factors including the strength of B cell receptor (BCR) signaling (10), and the drive to make a complete repertoire of natural Abs (6). Moreover, MZ and FO B cell numbers are also affected by other factors such as life span and retention and migration signals. B1 cell development also appears to be dependent on Ag selection (11). Whereas alterations in some molecules that affect B cell signaling result in parallel changes in B1 and MZ B cells, e.g., Aiolos (12), other examples demonstrate that these two B cell subsets are not always regulated in tandem as observed in CD22− mice in which B1 cells are increased but MZ B cells are reduced (13, 14). Here we show that splenic MZ B cells, as well as B1 cells, are expanded in mice deficient in serum IgM, with a corresponding reduction in splenic FO B cells, and that replacement with polyclonal, polyreactive IgM, but not monoclonal or oligoclonal IgM, reverses the changes in these B cell subsets. The generation of Sμ− mice has been described previously (2). Mice were backcrossed onto C57BL/6 mice for six generations and kept under specific pathogen-free conditions. Litter-matched controls were used for all experiments. The Vμ1 construct (gift from Dr. M. Neuberger, Laboratory of Molecular Biology, Cambridge, U.K.) encodes a VH (a allotype) gene that binds to anti-4-hydroxy-3-nitrophenenacetyl under control of a VH promoter (15). It was modified by restriction enzyme digestion so that the membrane exon of the transgene was deleted but the secretory exon remained intact (Fig. 2⇓A). The resulting 11-kb construct Vμ1s was used for pronuclear injection, and transgenic mice were generated by standard techniques. The mice were tested for the presence of the transgene by Southern blotting and PCR and were backcrossed six times onto C57BL/6 mice and subsequently onto Sμ− mice. Flow cytometric analyses were performed using standard techniques, stained cells were analyzed on FACScan, and files were plotted using CellQuest software (BD Biosciences, San Jose, CA). The MZ:FO ratio was calculated using absolute numbers of B cells in the CD21highCD23low MZ compartment and the CD21intCD23high FO compartment. Sμ− and litter-matched controls were injected i.p. on six occasions at regular intervals for 2 wk with 200 μg/mouse of a purified monoclonal (either TEPC-183, unknown specificity (here designated monoclonal A) or MOPC-104E, specific for α-1,3-glucose (here designated monoclonal B); Sigma-Aldrich, St. Louis, MO) or polyclonal IgM Ab (Rockland, Gilbertsville, PA). To induce a T-independent response, mice were immunized i.p. with 5 μg of phosphorylcholine-Ficoll (PC-Ficoll; Bioresearch Technologies, Novato, CA) in PBS. Mice were bled at regular intervals during the 2 wk after the immunization. Ig and Ag ELISAs were performed as previously described (2) using anti-class or -allotype reagents (BD PharMingen, San Diego, CA). The myeloperoxidase ELISA was performed with a Captia myeloperoxidase ELISA kit (Trinity Biotech, Bray, Ireland). Standard immunofluorescence staining procedures were used on frozen spleens sections stained with FITC-conjugated anti-mouse IgM and Texas Red conjugated anti-mouse IgD (BD PharMingen). Sections were viewed using a confocal microscope (Axiovert 100; Zeiss, Oberkochen, Germany). Mature splenic B cells can be divided into MZ and FO B cells and can be distinguished by surface markers using FACS. MZ B cells (CD21highCD23low) are expanded in 4-mo-old Sμ− mice, whereas FO B cells are reduced (Fig. 1⇓A). Whereas the increase in MZ B cell numbers is 2.5-fold, the reduction in follicular B cells is less (a 25% reduction) based on proportion of absolute cell numbers for individual mice. Wild-type (WT) and Sμ− mice have the same number of splenic B220+ B lymphocytes (WT, 1.27 ± 0.26 × 107; Sμ−, 1.12 ± 0.17 × 107). This contrasts with the cellular changes observed after a T-independent response to PC-Ficoll where MZ B cell numbers increase in both WT and Sμ− mice (compare immunized with naive) whereas absolute FO B cell numbers are unchanged. In older mice (12 mo) the MZ:FO B cell ratio is increased in WT mice and the difference in MZ/FO B cell ratio between Sμ− and WT mice is less striking at this age (Fig. 1⇓, A and B). Spleen sections taken from naive 4-mo-old Sμ− mice stained with anti-IgM/anti-IgD demonstrated a larger IgMbrightIgDdull MZ area on the periphery of the follicle compared with WT controls, further demonstrating the expansion in MZ B cells in Sμ− mice (Fig. 1⇓C). There is also an increase in the number of splenic CD21lowCD23low B cells which predominantly consist of newly formed B lymphocytes but would also contain splenic B1 cells. 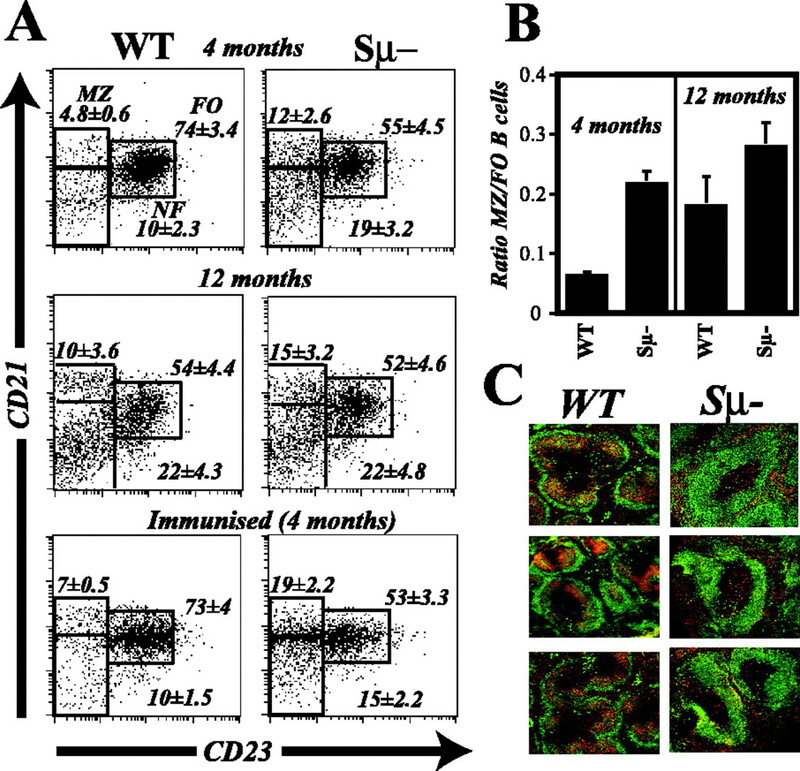 Although the numbers of splenic B1 cells are small compared with B2 cells, there is an increase in B1 cells (CD5+) in Sμ− mice (4.5 ± 0.7% within the splenic B lymphocyte gate) compared with WT mice (2.26 ± 0.3%), consistent with previous observations (1). 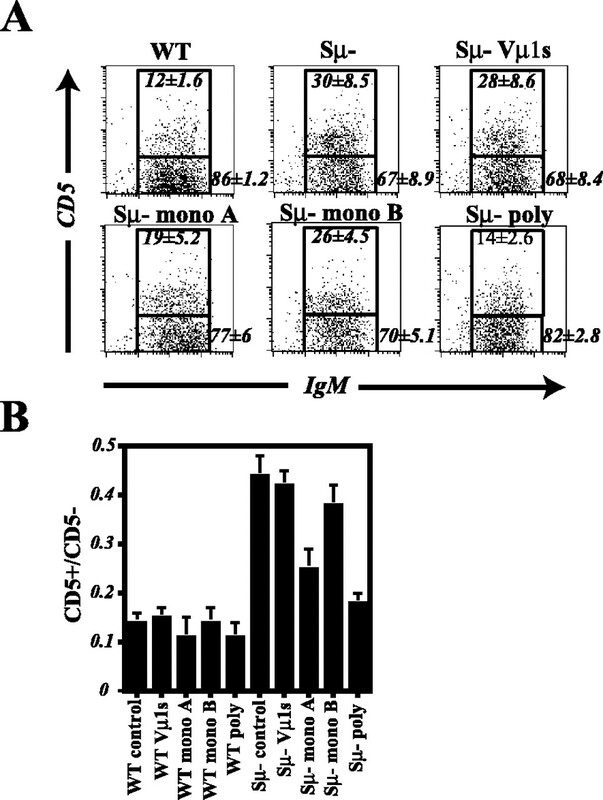 Splenic B cell subsets in Sμ− mice. A, FACS analysis of spleen cells derived from Sμ− and litter-matched controls either naive (4 and 12 mo) or 2 wk after immunization (4 mo) with PC-Ficoll, stained with anti-B220, anti-CD21, and anti-CD23. The profiles are representative of results obtained from 6–10 mice and are gated on B220+ cells. NF, newly formed. B, Histogram showing splenic MZ:FO B cell ratios calculated using absolute cell numbers in individual cell fractions. MZ and FO were defined from FACS analysis as illustrated in A. C, Three representative spleen sections derived from unimmunized Sμ− and litter-matched control mice (4 mo) stained with anti-IgM (green) and anti-IgD (red). The FITC (IgM) is very bright in the Sμ− mice, quenching the Texas Red (IgD) signal; the FACS data provides more quantitative data about the number of follicular cells. To determine whether polyclonal IgM was critical in governing the B cell compartments, two approaches were used. The first was to generate a transgenic mouse line (Vμ1s, IgH a allotype) in which B lymphocytes secreted a μ H chain, but the construct was engineered so that no transgene expression was detectable on the B cell surface (Fig. 2⇓A). These Vμ1s-transgenic mice were backcrossed onto C57BL/6 mice and subsequently onto Sμ− mice to test whether MZ expansion would be reversed. Consistent with the removal of the CμM exons, B lymphocyte membrane expression of the transgene was undetectable by FACS (Fig. 2⇓B), but IgM (derived only from the transgene) was present in the serum of Sμ−/Vμ1s mice (Fig. 2⇓C). These mice would therefore have a secreted oligoclonal repertoire generated by a number of L chains pairing with the VH chain. The second method of replacing IgM was to administer a polyclonal preparation of IgM or two IgM monoclonals i.p. every 3 days for 2 wk. The serum concentration of these preparations during the 2-wk period were identical (Fig. 2⇓C). Effects of IgM reconstitution on B cell subsets. A, Transgene construct of Vμ1s. The secretory μ tailpiece (tp) and the μs polyadenylation site are located within the Vμ1s construct; the μ constant region (CμM) and the μm polyadenylation have been removed from the original Vμ1 construct and are shown for information only. B, FACS analysis of spleen cells taken from mice expressing the Vμ1s transgene using IgM allotype-specific markers. The IgM allotype of the Vμ1 transgene and the targeted Sμ− allele are a, whereas the BL/6 allotype is b. C, IgM serum concentration in Sμ−/Vμ1s mice and in mice that had received a polyclonal (poly) preparation or two monoclonal (mono A, mono B) preparations of purified IgM measured 2 days after the final injection of the different IgM preparations (three mice per group). Samples taken 1 or 2 days after each injection were not significantly different from results shown (data not shown). •, IgMb allotype; ○, IgMa allotype. D, Representative density plots to define proportion of MZ and FO cells using CD21 and CD23 as markers after administration of monoclonal A, monoclonal B, and polyclonal IgM (poly) and in Sμ−/Vμ1s mice. The density plots shown are gated on B220+ B cells. E, Histogram showing splenic MZ:FO B cell ratio calculated using absolute cell numbers in individual cell fractions as shown in D. MZ and FO were defined from FACS analysis as illustrated in Fig. 1⇑A. Each bar represents the mean of six mice ± SD. F, Representative spleen sections derived from Sμ− mice treated with monoclonal B or polyclonal IgM stained with anti-IgM (FITC, green) and anti-IgD (Texas Red, red). All mice were between 3 and 4 mo old. The main conclusion from these series of IgM replacement experiments is that only the polyclonal IgM preparation returned the increased splenic MZ:FO B cell ratio found in Sμ− mice back to that observed in control mice as shown by FACS and tissue staining (Fig. 2⇑, D–F). A much smaller reduction in the MZ:FO B cell ratio occurred after administration of monoclonal A. The increased IgM staining on the periphery of the follicle seen in Sμ− mice was restored to control levels by the administration of polyclonal IgM but not by the other monoclonals or in Vμ1/Sμ− mice (Fig. 2⇑F). Consistent with previous observations, peritoneal B1a cells were increased in Sμ− mice (1, 2). This expansion in B1a cells was reversed by polyclonal IgM and to a lesser extent by monoclonal A but not in those mice expressing the Vμ1s transgene or the mice that had received the monoclonal IgM B preparation (Fig. 3⇓). B1a peritoneal B cells. A, FACS analysis of peritoneal cells gated on B220+ lymphocytes; B, histogram of CD5+ peritoneal B cells in naive mice. Mouse groups are the same as shown in Fig. 2⇑E. Numbers refer to the mean percentage of total B cells in each gate. The CD5+:CD5− ratio was calculated using absolute cell numbers from peritoneal washes in each group. Mono, monoclonal; poly, polyclonal. To determine whether the reactivity of the different IgM preparations was associated with their ability to influence MZ and B1 cells, binding to four different Ags was assayed. Analysis of the binding of these IgM preparations to the Ags tested confirmed the multireactivity of polyclonal IgM which bound all four Ags strongly and monoclonal A bound two Ags strongly, whereas monoclonal B bound only one Ag (Fig. 4⇓). 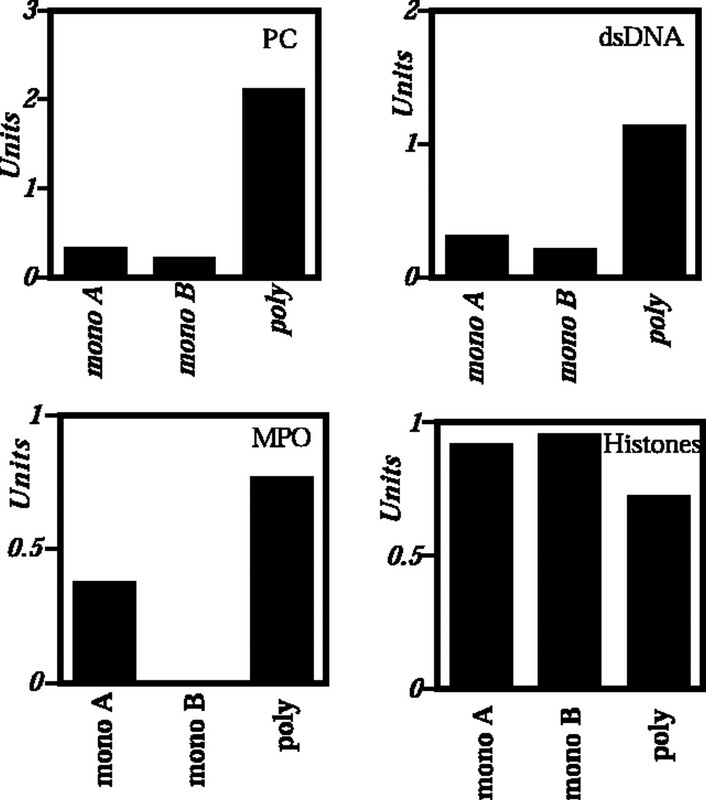 Analysis using HEP-2 cells for antinuclear Ab staining demonstrated that the polyclonal preparation and monoclonal A but not monoclonal B were positive (data not shown). Thus, the Ag reactivity of the IgM preparations correlated with their ability to reverse the changes in B cell subsets found in Sμ− mice. Reactivity of the three IgM preparations to PC, dsDNA, myeloperoxidase (MPO), and histones. Units were calculated using a serum from a 7-mo-old female NZB/W mouse as a reference, except for PC in which the positive control was a serum derived from a mouse immunized with PC. Mono, monoclonal; poly, polyclonal. The major finding of this work is that a selective deficiency of serum IgM leads to an increase in splenic MZ B cells with a proportionally smaller reduction in FO B cells. Furthermore, the fact that the increased MZ:FO B cell ratio is fully reversed by adding back polyclonal, but not monoclonal or oligoclonal, IgM suggests that a full repertoire of IgM molecules is required to regulate these B cell subsets. The difference between these preparations of IgM on splenic B cell subsets may be due to the multiple Ag reactivity of polyclonal IgM because this preparation bound to all the Ags tested and had the greatest effect on the MZ:FO B cell ratio. Monoclonal B had the least reactivity of the IgM preparations and no effect on the MZ:FO ratio. Administration of polyclonal IgM also reversed the expansion in peritoneal B1 cells previously documented (1, 2). Although there are a number of mechanisms that might explain the increased MZ:FO B cell ratio seen in Sμ−, as discussed below, we favor the hypothesis that IgM is acting as an adjuvant to deliver enhanced (self) Ag-driven signals to the BCR. It has been proposed that the balance between splenic MZ and FO B cells is regulated by B cell signaling and that increasing clonal B cell signals favors the formation of FO over MZ B cells (10). The pentameric structure of IgM, in contrast to IgG, can potentially yield a high avidity for Ag despite a low Ag-specific affinity. Moreover, one molecule of IgM can activate complement, whereas two IgG molecules are required; this may lead to enhanced complement coating of selected self Ags when complexed to IgM, resulting in more efficient engagement of coreceptor signals (16, 17). Consequently, BCR signaling could be reduced and MZ B cells preferentially formed in the absence of IgM, despite normal levels of serum IgG. A similar process may apply to B1 cells, which are also sensitive to Ag drive (11), because polyclonal IgM also reversed the expansion of this B cell subset. The MZ:FO B cell ratio increases in mice as they age (this work and Ref. 18), which may be explained by defective signaling through the BCR which is also associated with aging (19), because MZ B cells are preferentially formed when BCR signals are reduced (10). Thus, the less striking difference between older Sμ− and control mice could be attributed to the already dampened BCR signaling associated with age. The expansion in MZ B cell numbers in Sμ− mice may be explained by a number of mechanisms apart from B cell signaling. Mice bearing Ig chain transgenes with a variety of Ag specificities have an increased MZ B cell compartment. Because these mice have a restricted Ab repertoire, it has been proposed that the drive to make a complete repertoire increases MZ B cell numbers (6). Clearly, in Sμ−mice, the secreted IgM repertoire is absent whereas a full membrane IgM repertoire is present. If this proposed drive arises from the serum Ab repertoire then one would predict, as is observed here, that in Sμ− mice MZ B cell numbers would be increased and that polyclonal but not monoclonal IgM would reverse the changes. 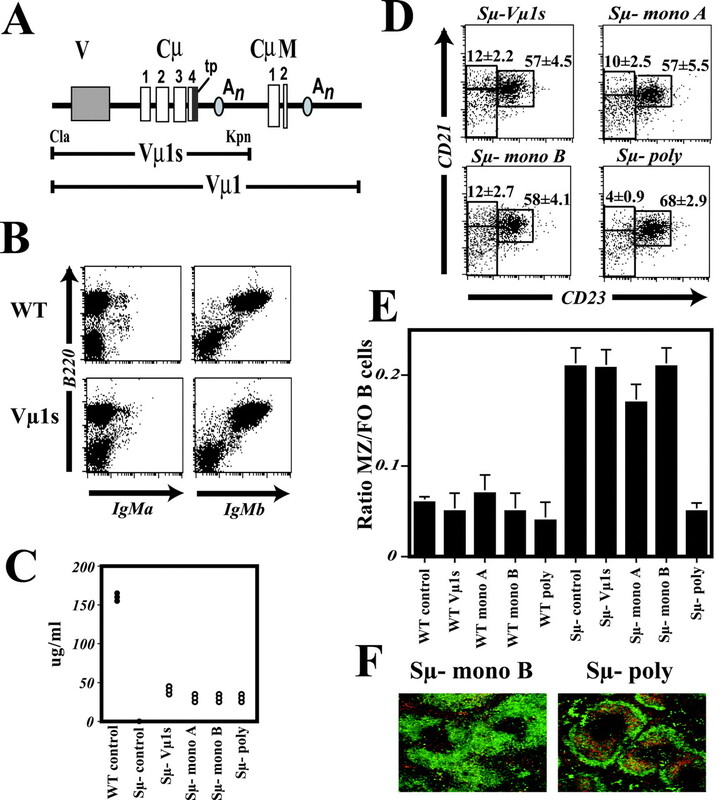 The transgenic mouse Vμ1s crossed onto the Sμ− mouse also has a restricted secreted IgM repertoire with a normal membrane BCR repertoire, supporting the notion that it is the secreted repertoire that is important in governing B1 and MZ B cell numbers. This line of reasoning, however, presumes that the serum IgG repertoire does not constitute a full Ab repertoire. A loss of diversity in the Ab repertoire is also observed in aging (associated with increased production of autoantibodies) and may link the increased MZ:FO B cell ratio seen in the absence of IgM and as animals age (18, 20). The fact that the administration of monoclonal and polyclonal IgM have different effects despite achieving the same serum concentration suggests that the increase in MZ B cells is not due to a feedback mechanism that simply senses the IgM concentration. However, polyclonal IgM may have an advantage even in this situation if a putative FcμR binds preferentially to the altered confirmation arising out of IgM complexed with Ag. An FcμR has been described, although not with these properties (21). However, a recent report has demonstrated that serum IgM is a ligand for CD19 (22), and B1 and MZ B cells are affected by alterations in CD19 expression (8, 23). One apparent paradox of these observations is the short time (2 wk) required to reverse the MZ:FO ratio coupled with the evidence that MZ and FO B cells have a relatively long life span (24). This long life span, however, is somewhat dependent on the numbers of immature B cells entering the mature B cell pool. The finding that newly formed B cells increase in Sμ− mice may suggest either that these cells are being retained in this pool longer or that there are more immature B cells exiting from the marrow. It is known, and confirmed here, that MZ B cell numbers change during a 2-wk period after encountering T-independent Ags (6). Thus, changes in these B cell subsets could occur through a variety of mechanisms including alterations in cell proliferation or apoptosis, or by interchange between the MZ and FO B cell pools, although how IgM influences these processes remains to be investigated. It is tempting to speculate that IgM, through regulation of these B cell subsets, may have a role in suppressing the autoimmunity that occurs in mice strains where the MZ and B1 B cells are expanded. We thank Dr. Michael Neuberger for critical reading of the manuscript, helpful discussions, and provision of the Vμ1 construct; Dr. Ian Maclennan for helpful discussions; and Dr. Anne-Marie Jones for assistance in generating the Vμ1s construct. ↵1 This work was supported by Grant E0532 from the Arthritis Research Campaign, U.K.
↵3 Abbreviations used in this paper: Sμ−, serum IgM deficient; MZ, marginal zone; FO, follicular; BCR, B cell receptor; PC, phosphorylcholine; WT, wild type.